Capper / over-lidders, or over-lid cappers are designed to apply a cap or lid onto a container on top of another cap or some other type of seal. Overlids are often resealable snap-on caps that are simply snapped onto the container. Over-lid cappers are designed to take in a container that already has a cap or some type of film closure. The over-lid capper feeds an over-lid from a magazine and places the over-lid on top of the container. The container and cap then usually pass under a set of pressure rollers to snap the over-lid in place. Some can over-lid cappers are designed to place over-lids on cans as the cans are on their sides. The cans are driven through the over-lid capper by drive belts that cause the can to turn. Pressure rollers are also used to snap the over-lid in place. Besides over-lids on cans, over-lids can also be found on top of aerosol containers and on top of plastic containers or cups that have been sealed with a foil or film seal. (Consumer products such as cream cheese, cottage cheese, or cans of chips use a package with a foil seal and an over-lid snap on cap.) Dosing cups on the caps of medicine bottles are also referred to as over-lids. Akra Pak, Model CEL4, pneumatic operated over lidder. Rated from 10 to 40 cpm – depending on materials, application and machine configuration. Equipped with a 3" wide x 60" long lugged conveyor set on 8" centers, 50" long lid magazine with screw style denester, peel off lid applicator and a 6" diameter pneumatic lid press station. Automatic, stainless steel, inline overlidder rated from 40 to 150 lids per minute – speeds depending on materials, application and machine configuration. Equipped with a 4.5" wide x 164" long Delrin conveyor with adjustable guide rails, star wheel, 48" long spinning rod lid magazine, snap on lid applicator, top compression section, no container no lid, variable speed controls and interlocking Lexan safety guarding. Mounted on height adjustable legs. Wrabacon Inc, inline container laner and snap on over lidder. Rated from 20 to 250 containers per minute – depending on materials, application and machine configuration. Equipped with a 17½" wide x 57" long Intralox style infeed belt with a 1:2 lane overhead diverting arm. 17¾" wide x 90" long rubber belt thru (2) lane snap on over lidding station with suction cup denesting and 12" long overhead roller compression section and 17½" wide x 84" long Intralox discharge conveyor. Control panel with GE controller and push button start / stop controls. 6 Head rotary, twin turret, over-lidder designed to apply press on over-lids rated from 50 to 250 cpm – speeds depending on materials and application. Equipped with inclined feeder has 144" L x 8" W conveyor 2" H cleats on 6" centers, 34" L x 32" W x 30" D cap hopper, with 124" discharge height 48" dia bowl feeder, with cover and discharge chute were caps enter open side up, and reversed in chute to orientator, then orientated into lower chute to cap turret, containers feed into star wheel product in feed, to cap turret were cap is applied and pressed on and then leaves machine in star wheel discharge, with A/B PLC. DEL, Model SASRC-CC, automatic, stainless steel, inline overlidder. Rated from 20 to 200 containers per minute – depending on materials, application and machine configuration. Equipped with 175" long x 6" wide plastic Delrin conveyor with adjustable guide rails, 24" long screw in feed, 30" long lugged chain container handling conveyor with container grippers pockets, 68" long powered spinning roller lid magazine and 5" long roller compression section, grippers then open up and release down conveyor belt. Control panel with AB controller, AB PanelView Plus 400 touch pad display, push button start / stop variable speed controls. Mounted on (8) leg base frame. Automatic, horizontal rolling, overlidder rated from 90 to 250 containers per minute – speeds depending on materials and application. Container size range: 401 in Diameter; up to 700 in Height. Equipped with a 97" high vertical lid magazine extension, 43" long spinning rod lid feeder, metering belts, adjustable can height, and wipe on capping action with compression section. Mounted on height adjustable legs. Orics, Model ACP-150, automatic, stainless steel, inline overlidder. Rated from 20 to 150 lids per minute – depending on materials, application and machine configuration. 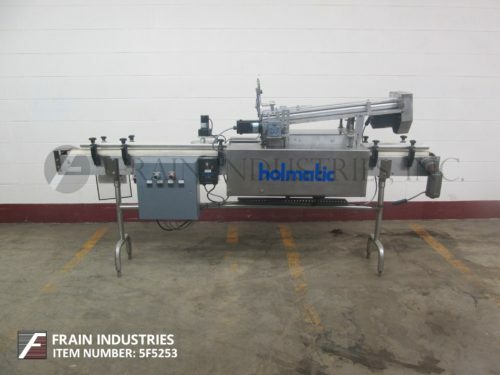 Equipped with a 120" long x 7" wide plastic Delrin conveyor with adjustable guide rails, 24" long worm screw in feed, 46" long powered spinning roller lid magazine and 11" long compression belt. Control panel with a GE Fanuc controller, push button start / stop controls and on / off switches. Accutek, Model 50-551-000, AccuSnap automatic stainless steel snap capper. Rated from 20 to 120 containers per minute – depending on materials, application, environment and machine configuration. Cap size range: 10mm to 60mm, Cap snap types: milk jugs, dropper inserts, lip balmcaps, over caps and more with proper change parts. 29" diameter x 10" deep centrifugal cap feed hopper with rotating orientator disc, cap chute, 36" L x 1" W single container gripper belts and 35" L compression belt. Control panel with hopper, and gripper conveyor speed control dials. Mounted on stainless steel height adjustable base frame with casters and mounted over a 73" long x 3¼" wide Delrin style conveyor. Holmatic Model PH-41C, automatic, lid applicator rated from 60 to 150 containers per minute – speeds depending on materials and application. Equipped with 36" long lid magazine, with 132" long x 3-12" wide container conveyor (needs belt) with 28" long dual side belt assist, no container / no lid, start / stop push buttons, Vari speed with speed dial controls, mounted on (4) leg base frame and can apply injection molded reclosure lids to metal or fiber cans.